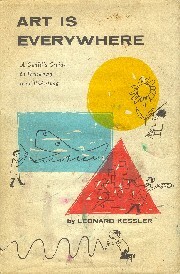 Leonard Kessler (1920-) has illustrated more than 200 children's books, most of which he also wrote, and 40 of which he created with his wife Ethel. A prolific guy! Most of these are designed for beginning readers, and three have been listed on the annual New York Times Ten Best Illustrated Books for Children. Mr. Pine's Purple House is a cute and simple Easy Reader about the merits of non-conformity in a world full of peer pressure. We've had lots of requests for it, and sometimes the book would elude us for years, then pop up in the most unexpected places. It later became the namesake for another used book dealer who started reprinting lost children's classics, and thanks to Purple House Press, three of the Mr. Pine books are available in beautiful and affordable new editions. Are We Lost, Daddy? Grosset & Dunlap, Inc., 1967. Are You Square? Doubleday & Co., 1966. Art is Everywhere. Dodd, Mead & Co., 1958. Big Mile Race. Greenwillow, 1983. Big Red Bus. Doubleday & Co., 1957. Day Daddy Stayed Home. Doubleday and Company, 1959. I Made a Line. Wonder Books, 1962. 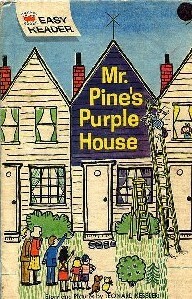 *Mr. Pine's Purple House. Wonder Books, An Easy Reader Book, 1965. Purple House Presss, 2000. *Mr. Pine's Mixed-up Signs. Wonder Books, 1961. Purple House Press, 2002. Mr. Pine's Storybook. Grosset & Dunlap, 1982. *Mrs. Pine Takes a Trip. Grosset & Dunlap, 1967. Purple House Press, 2005. Paint me a picture, Mr. Pine. Illustrated by John Kuzich. Ginn, 1972. Splish Splash! Parents' Magazine Press, 1973. Slush Slush! Parents' Magazine Press, 1973.